Fall is here. The leaves are changing colors and the weather is cooling down. The best thing about this season, is that it is picking season. We have picked fruit all summer long with strawberries, blueberries, cherries and raspberries. Now it is time for APPLES! “New York grows more apple varieties than any other state. With nearly 700 growers and 10,000,000+ trees, we produce enough apples each year to bake 500 million apple pies!” the NY Apple Country states, that is a lot of apples. There are more than 40 different types of apples in NY, differentiated by their sweetness, tartness and uses. Some better for baking, others for cooking and as if, to eat and enjoy. Many health benefits are associated with eating apples – lowers cholesterol, fights cancer, keeps you full and helps you slim, fights colds, decreases risk for diabetes, boosts brain power, rich in antioxidants, boosts immune system, assists in becoming the teachers preferred student, “An Apple a Day Keeps the Dr. Away….” and more. Apples stay fresh longer than many other fruit, they are wonderful in anything you can think of from Danish Pancakes (Aeble Skiver) to apple pies, Tarte Tataine and also add to salads, chicken and on their own. 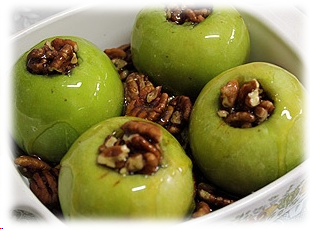 One of my favorites is easy, tasty and perfect for any occasion is Baked Apples! Take 6 Granny Smith Apples, or another tart apple. Take the apple core out, but leave a thick rim around inside the apples and make sure not to cut holes in the apple. Create a cup like apple. Fill the apples and dust the top with additional cinnamon and sugar, or nuts and honey. Place all apples on a baking tray and bake for 25 minutes in 350F/180C- The apple should be baked, but not too soft. Enjoy the apples warm with a scoop of vanilla ice cream or whipped cream. Up state NY is wonderful for Apple Picking. Support local farmers like Hoffmire Apple Orchard. Greg Hoffmire has created a beautiful U-Pick orchard because he loves having families come out and pick delicious apples. Lastly, Ba-Li Cravings will have a table at this years Apple Harvest Fest on Downtown Ithaca Commons. We are preparing wonderful treats- our unique VEGAN and GLUTEN FREE apple truffles, our delicious baked cannoli with vanilla cream and apple sauce, Tarte Tatain and more. All prepared with LOCAL, fresh picked apples. Stop by, say hello and tell us you read our blog…. any sharing is appreciated! Ithaca’s premier event of the Fall, Apple Harvest Festival, is a three day celebration of food, fun, and apples! First time visitors can witness a variety of wonderful local entertainment while strolling Ithaca’s recently remodeled outdoor pedestrian shopping mall, The Ithaca Commons. The pedestrian mall is the epicenter of the festival and the gateway to a nostalgic journey of harvest season fun. Over 100 vendors will be selling unique apple varieties, hot apple cider donuts, kettle corn, local farm fresh-baked goods and a multitude of around the world specialties. Local farmers are on site selling everything from tasty apple beverages to local pumpkins and of course, apples, apples and more apples. Wineries and cideries have regional beverages available for tasting and purchase. Kids can visit with the goats and learn how fiber is made with Laughing Goat Fiber Farm. Looking for quality goods, visit 50 different handcrafting artisans along Cayuga Street at the fall craft show which includes jewelry, ceramics, home decor, body care, specialty gifts, unique sculpture, clothing and so much more. Enjoy the beautiful U-Pick season and come visit us at the Apple Harvest Fest.